Just a quick one to let you know that we offer 10% discount codes for recommendations of our kit! It doesn’t matter how long ago you bought it – write a great review and link it to us via FetLife (@Edgeplay_co_uk) or e-mail (sales@impact-toys.com or sales@edgeplay.co.uk). Reviews can be posted on FetBook, FetLife, the product pages on our websites, your own personal blog or website, Tumblr… it doesn’t matter! As long as we can find it and link other customers to it. Reviews should be stand-alone posts – while we of course LOVE comments on our pictures and threads, to get 10% off codes your review needs to be a writing, article, photo-set, thread etc in it’s own right or a review on the product pages on our website. So what are you waiting for? Dust off your keyboard and let us know how much you’ve enjoyed your toys! So I have already moved the whip making forwards and started using leather shot bags and bolsters in the core of my whips, moving on from the lead weighted core I developed over the past few years. It has been an amazingly steep learning curve, just from changing one thing. My new leather splitter has arrived as well - who would have thought shaving off 0.25mm of leather would make so much difference to the thickness of a whip? Now comes an even bigger learning curve… I have been making whips “wrong” for 4 years! Well, not “wrong” exactly… read on and you’ll find out. When I started making whips I used a ball chain core which made the whips very thin. To get a decent 16 plait I would add an extra belly to give it some bulk and taper, meaning my 16 plait whips had two plaited bellies. As I progressed onto lead weighted whips I just adjusted the strands of weight down to achieve the desired diameter and taper, giving a nice weight and feel in the hand. So I move onto using shot bags and apply the same formula: shot bag core, 8 plait belly, 12 plait belly, 16 plait overlay. The whips are turning out a bit chunkier than I was previously making them – not a huge difference, just about 25mm (+/- a few mm) in diameter but they are quite chunky, very much an American style whip. The trouble being that if I wanted to slim down the whips a little, I’d have to make the shot bag narrower and if I did this too much, I couldn’t get the lead shot down the whip far enough to be effective, leaving me with a quandary! Also I could never work out why it takes me so long to make a 6 footer 16 plait when other whip makers are doing them in half the time when our speeds are comparable on a 12 plait. Mystery! After a couple of conversations with a couple of the UK’s top whipmakers, I have come to the decision I have been making them “wrong”… now when I say wrong, I mean I am doing more work than necessary. There is no need for the second belly with a 16 plait shot bag whip as there is enough weight and taper built into it, so effectively I have been over engineering them and doing far more work than most if not all whipmakers are doing in synthetic whips with a shot bag core. This also means that comparatively I have been underselling my 16 plait work compared to the amount of work other makers are putting into theirs (about 100 foot of extra cord plaiting or 2-3 hours). So I redesigned my 16 plait bullwhip last night and proceeded to make a single belly 16 plait 6 foot and wow! What can I say? It was a real eureka moment. Not only is the whip sleeker (about 22mm at the handle), it is more responsive and has some real life to it. My heavier ‘American Style’ whips with the two bellies are great for targeting but this is a totally different animal. When I first started making whips someone said to me “you never stop learning”. This is just so true! You never do… you never stop learning, evolving and making a better whip, trying construction methods, trying new dimensions and materials keep trying to push the envelope. Thats the head scratching over with until the next time I find something I want to change/improve/modify. Oh, and for all you lovers of big heavy American style whips, do not fear! I am not doing away with the old faithful 2 belly 16 plait. It will be available still but priced more in line with the amount of work involved in it. This month we went a bit DC crazy and made a set of toys themed after The Joker and Harley Quinn from the Batman comics. The set includes two large floggers and two 4 foot premium snake whips, each coloured and themed after one of the characters. While it was a fun project, it was also a great showcase for our themed toys – we have so many leather and cord colours to choose from that we can make almost any of our toys suit a particular character, sports team, family crest… you name it! Add one of our glass conchos with a custom image for that perfect, finishing touch. We add popular themes to our Themed Toys section – we have Dr Who, Hello Kitty, Batman and Jack Daniels, to name a few. But you don’t need to choose from just those designs! The options for our custom toys give you the flexibility to make any theme your heart desires, and if you can’t find something you want, just pop us an e-mail and we’ll see what we can do! Over the last couple of months we have experimented with some great new styles of flogger, whip and dragon. All the decadence and sensuality of our rabbit fur floggers, but with extra thump due to the leather falls concealed within the fur. Available as custom order in a wide variety of colours. We don’t normally keep hair-on-hide leather in stock so these are very much a limited edition. We currently have one available and we can discuss custom requests via e-mail. The hair gives the flogger great ‘strokeability’ and makes for an interesting scratchy sensation when the flogger is used. A new custom flogger option. Embellish your custom flogger with a choice of plain metal or coloured crystal studs for some extra glamour and sting! We have only made one for sale so far, with a Star Trek theme. This will become available as a custom option depending on popularity. Why not let us know what you think on ourFetLife page? 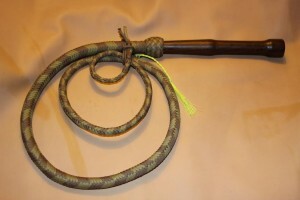 A new variant of bull whip for us, this whip features an exposed wooden handle instead of our normal plaited handle. Very ergonomic and makes for quite a striking whip! After much experimentation and development, Daz launched the newest incarnation of our bull whip, the Mark VI. The Mark VI nestles between our usual 12 plait (single belly) and 16 plait (double belly) versions, and features a 16 plait overlay with a single belly (as well as some other secret developments!). It gives the option for a lighter, more responsive whip that is more akin to the Australian bull whip style. We have since expanded this option to our entire range. You can find this option on all of our premium whips now. 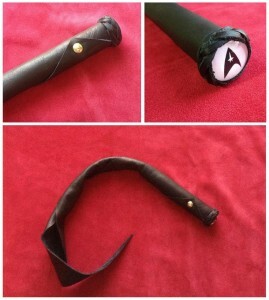 A variant of our standard flogger designs. The medium flail features 10 wide cut falls in a heavy leather or suede, perfect for punishment. The large flail is the largest flogger we make, with spectacular 24 inch falls and a long handle for extra leverage. Available in a stingy or thumpy variety.